Approximately 15 percent of dogs and cats become lost each year, and only 85 percent return home. You can use a microchip service to keep your cat from being one of the 40 to 60 percent of animals in shelters who are not strays but instead lost pets. Research has shown microchipping your pet increases the chance you will be reunited. Claire Fisher, HomeAgain® representative, describes HomeAgain®'s core service as "a state-of-the-art microchip. The HomeAgain® microchip has a Bio-Bond™ patented anti-migration feature that bonds to the skin so it will permanently stay between your pet's shoulder blades once implanted." When a microchip scanner is passed over the pet's shoulders, the chip emits a frequency so that the microchip's unique ID number can be read. 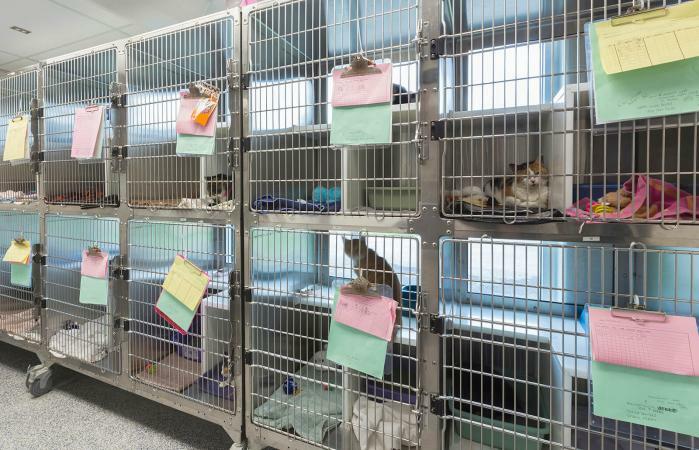 Virtually every shelter and veterinary clinic has a scanner to read microchips. When a pet's microchip is scanned and HomeAgain® is called with the unique microchip ID number, "We use it to look up the owner's contact information in our database. We then get in touch with the owners to let them know where their missing pet is." In addition to their microchips, HomeAgain® offers five services related to finding lost pets. Once your dog or cat is microchipped, their ID number and your contact information is added to a database. This is the database used to contact owners when a lost pet's chip has been scanned by a veterinarian or shelter. The cost to make updates to your contact information is free. The company runs a call center staffed 24/7 who prepare Lost Pet Alerts for local shelter and veterinarians and work with you to help you find your pet. The center has a toll-free number to call. This service is part of HomeAgain® annual membership, which is about $20 per year. These alerts are sent out to other HomeAgain® members who live within a 25-mile radius of where your pet was lost. They also are sent to animal shelters and veterinary clinics. With membership, you can add a photo of your pet and prepare a lost pet poster from their template. Rapid Lost Pet Alerts is part of the annual membership fee. Another service included in the annual membership cost is a 24/7 poison control hotline staffed by veterinarians from the ASPCA. This service is normally $65 per call for pet owners. The veterinarians will review your case with you, give you advice for immediate care of your pet, and help you with working with your local clinic if your dog or cat requires a medical visit. If you're a member of HomeAgain® and your pet is found over 500 miles from your home, HomeAgain® will give you up to $500 toward covering the cost to fly the pet back to you. Updating your information in the database is always free. Additional HomeAgain® services are about $20 per year, although the first year is free. The cost to have a microchip installed is up to your veterinarian but according to Fisher, it "usually costs between $25 and $60." If you rescue a dog from a shelter, the cost of the microchip is often included in the adoption fee. HomeAgain® reports they have reunited over 2,000,000 pets and their owners. Though this is an impressive statistic, the program does receive low reviews on consumer sites such as Yelp. Most of the complaints are centered on customer service and the annual fee, although the fee is not required to register or update a pet's information. There may be a push to register for the paid service that makes it unclear to pet owners that they can skip this option and simply register their pet's ID and their contact information. However, the implant kit get high marks on Amazon.com with an average of 4.1 out of 5 stars. Customers cite its ease of use, although one should have some veterinary or vet technician experience before attempting to microchip a pet on your own. Another issue with HomeAgain®, as well as several other large microchip services, is they maintain their own database. If you have pets microchipped by different services, they will not appear in the database. There are many free national microchip registries that contain microchips from all services, and it's a good idea to register your pet with at least one of these such as FoundAnimals.org. If you decide to go with HomeAgain®, make sure you regularly update your information. Keep in mind as well that you do not need to pay for their additional services to ensure your database entries are correct.